The best cure for your excess energy! The Fidget Spinner game that is quite popular nowadays helps you relax and relieve stress with just a few simple spins. Because of the popularity of this game, now you can find a great simulation game that offers you the same feeling as the real one and download it on your smartphone. To help you, entertain yourself and relax your mind, we discovered one amazing simulation of this fidget game – Fidget Spinner Deluxe. Let’s see what the game offers you. What is Fidget Spinner Deluxe all about? For all lovers of the fidget spinning game, this fidget spinner toy simulation game offers the players the most exciting and fun way for them to spin directly from their phone, relaxing and reliving from stress each time they swipe on the screen to spin the toy. This game is developed for android users with a simple and yet very addictive gameplay, offering realistic visuals and variety of colorful fidget toys from which the player can choose from, having endless fun playing. Spinning as much as they want, with the game players can distract their brain and stressed mind. 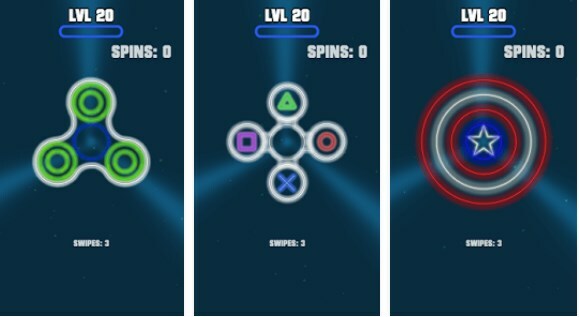 On this simulation game for fidget spinning, players have the chance to experience the realistic feeling of fidget spinning directly on their phone. With the amazing features offered by the game, players can effortlessly enjoy with each spin of the toys, relaxing and reliving their anxiety and stress. On the game all the movements of fidget toys in real time are simulated by the game, helping players to get the true fidget experience. The colorful visuals on the screen and the amazing fidget spinners with variety of choices, offer players to constantly keep interested in playing, getting them addicted to spinning fast. With simple and yet addictive gameplay, the game allows players to enjoy spinning as much as they want playing just for their own fun or playing with their friends. All players just with swipe on their finger can spin the fidget left or right and see how many swipes they are able to do to. The one that swipes the hardest will get the most spins! Players have the chance to unlock many different and colorful fidget spinners for their endless fun on this stress reliving and fun game. Download it now for free on Google Play and relax your mind spinning!